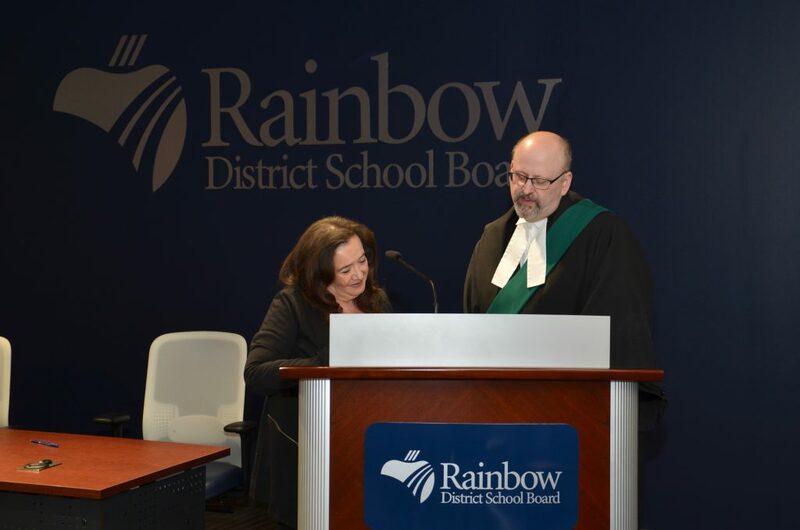 On Monday, December 3, 2018, Justice of the Peace Gary McMahon administered the Declaration of Office and Oath of Allegiance to Trustees serving on Rainbow District School Board over the next four years. 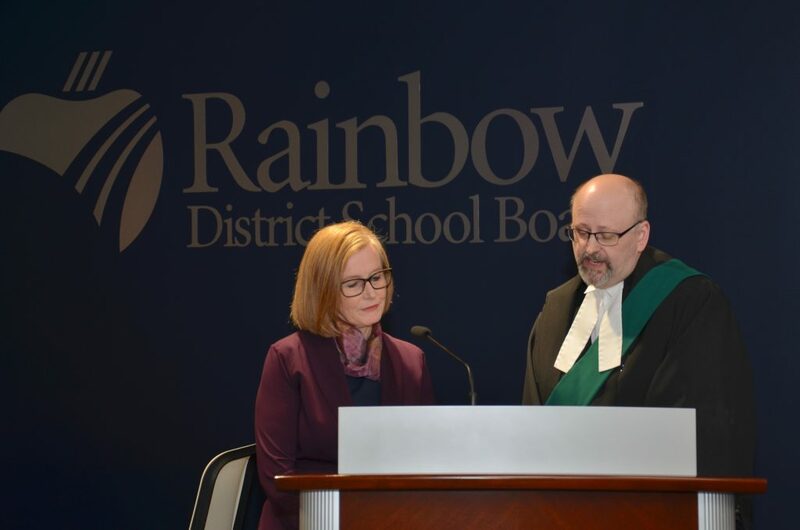 Following the swearing in ceremony, Trustee Doreen Dewar was acclaimed Chair of the Board and Trustee Dena Morrison was acclaimed Vice-Chair of the Board. Membership on Board standing committees was also approved. Doreen Dewar is the longest serving trustee on the Board with over 30 years experience, including nine years on the Sudbury Board of Education. She has been Chair of the Board for the past seven years and continues in the role. Prior to that, she served as Vice-Chair. Trustee Dewar has served multiple terms as Chair and been a member of every Board committee. As Chair of the Board, she made many presentations to Ministry Standing Committees. She has authored numerous newspaper articles and chaired many sub-committee meetings, including school review meetings. Doreen Dewar has been a teacher, homemaker, volunteer, coach and entrepreneur. She ran her own successful retail business for 11 years. She has received awards for community involvement both locally and provincially. Dena Morrison has been a trustee since 1998. She has served as Vice-Chair of the Board for the past seven years and continues in that role. She also served as Vice-Chair in 2003. From 2004 to 2008, she served as Chair of the Board. Raised in New Sudbury, Dena Morrison attended Col. David Younger Public School, Carl A. Nesbitt Public School and Lasalle Secondary School. She attended the University of Western Ontario. Trustee Morrison worked for the federal government for more than 20 years, gaining extensive experience in administration, policy development, human resource management, and budgeting. She held a number of positions of progressive responsibility at the local, provincial and national levels in Sudbury, Toronto and Ottawa/Hull. Trustee Morrison played a leadership role in community consultations to establish Northeastern Elementary School in Garson, which opened in September 2002. Trustee Morrison has also served on every Board committee as Chair or as a member over the past 20 years. A strong advocate for children, families and communities, Kerrie St. Jean has been an active volunteer in six schools over 18 years, including School Council Chair. After graduating from Sudbury Secondary School’s Performing Arts Program, Kerrie studied Business Administration and Native Early Childhood Education at Cambrian College. Kerrie has been a member of the College of Early Childhood Educators of Ontario, the Association of Education and Rehabilitation of the Blind and Visually Impaired, and the Council for Exceptional Children. She has co-chaired national and international conferences focused on supporting families, children, community professionals and educators. As Manager International Affairs with the CNIB, she is responsible for supporting advocacy and the rights of persons who are blind or partially sighted through global partnerships and education. In a previous role as Regional Manager, Northern Ontario, she was responsible for overseeing a team of professionals who deliver specialized services to individuals living throughout a vast geographic area, supporting their health care needs in vision loss rehabilitation. She also worked on the development and implementation of specialized services to families of children who are blind or partially sighted in Northeastern Ontario, a role that was expanded to provincial and then national oversight of best practices and evaluation. Kerrie St. Jean lives in Whitefish with her husband and three children. Anita Gibson cares deeply about schools and learning and has a keen enthusiasm for politics at the local level. She believes local decisions can have the greatest impact on people’s lives. She graduated from university with a degree in Economics and Marketing and the inspiration to be a lifelong learner. 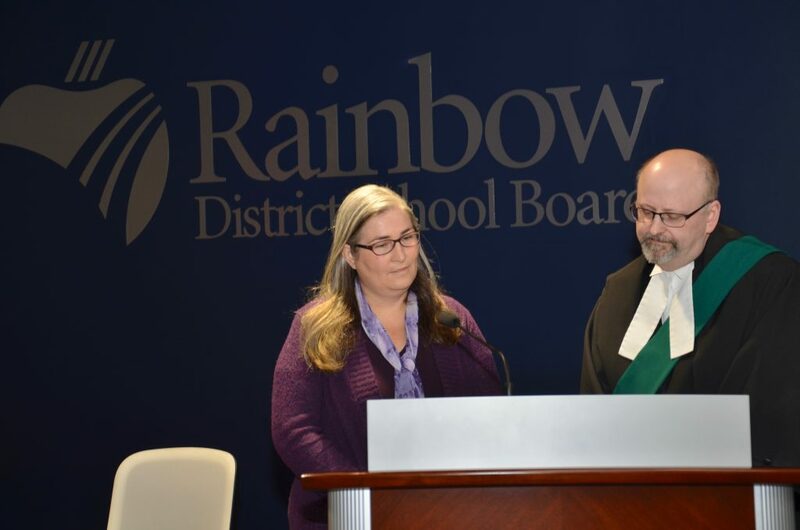 She has been married to husband Dylan for over 20 years, and they have two children currently being educated within Rainbow District School Board. Since her children began school, she has been a member of their school council. 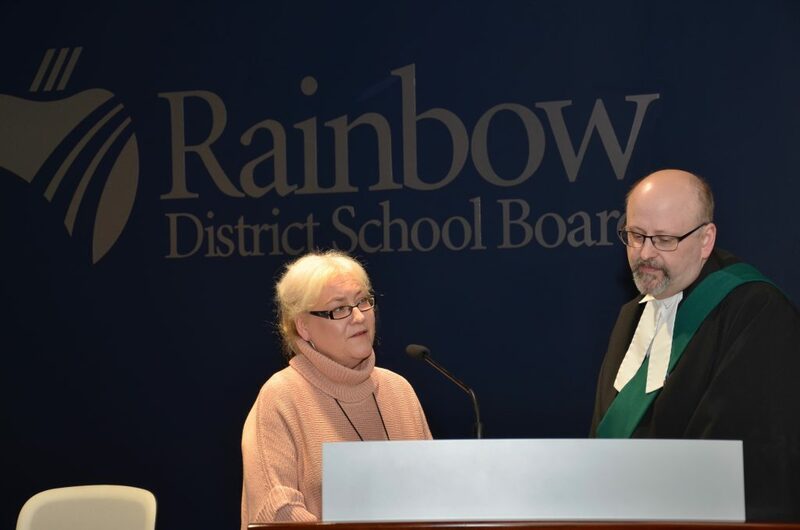 Through many years of advocacy, she has established relationships to regularly connect with education stakeholders from across the province. She has participated in various workshops and consultations with the Ministry of Education and has developed an understanding of educational policy, procedure and politics. 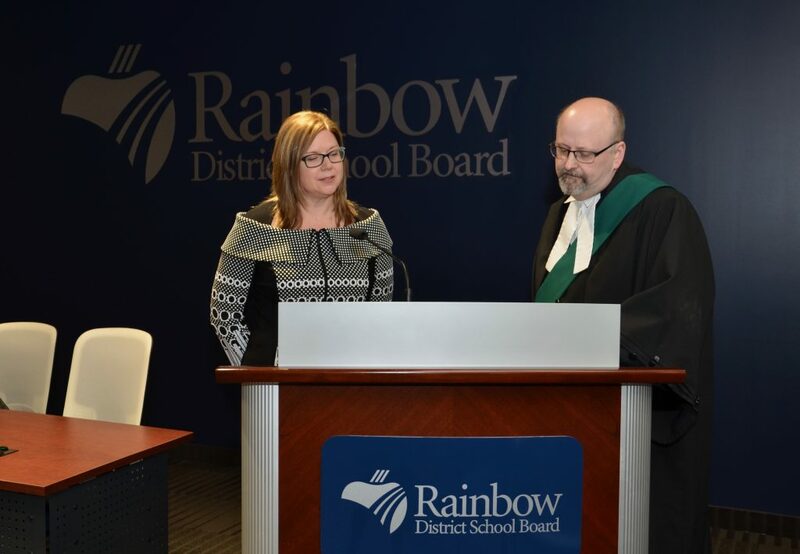 She looks forward to consulting with the stakeholder community on the board’s multi-year strategic plan to ensure our efforts and actions are aligned and coordinated to best support the students and staff of Rainbow District School Board. 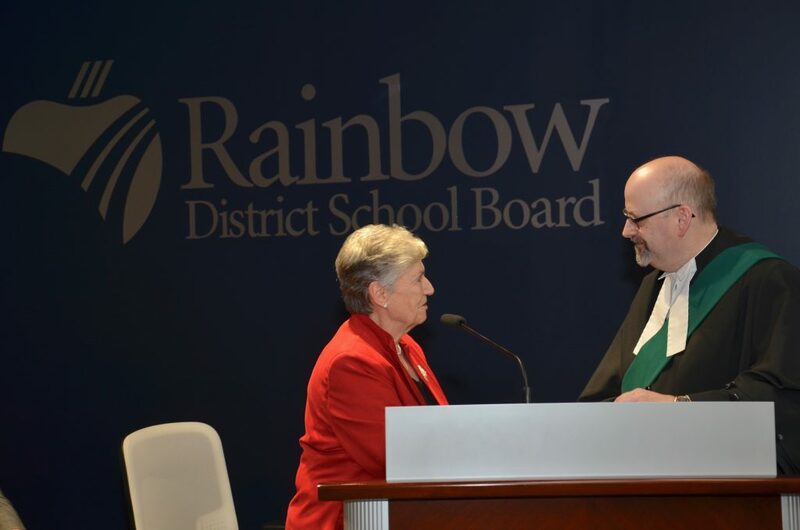 Judy Kosmerly joined Rainbow District School Board in 2014 and was acclaimed for a second term in 2018. Judy Kosmerly worked for the provincial government for 34 years, retiring in November 2011. Most of her work experience centered on the provision of services and supports to vulnerable persons, especially persons with a disability. She played a leadership role in the closure of the last Developmental Services facilities, as well as in the creation of a single regional access centre for adults seeking developmental service in their home communities. She developed several information booklets for families, worked in partnership with local services to implement planning and support programs, and received a Deputy Minister Award in 2012 for Outstanding Achievement in Partnership. She was a member of the Board of Directors of the Canadian Mental Health Association – Sudbury/Manitoulin from 2012 to 2016 and is a strong supporter of community inclusion for all persons. Judy Hunda has been extensively involved in the educational community for 32 years locally and provincially. Elected in 1997, she has represented residents of Area 6 in the City of Greater Sudbury since the creation of Rainbow District School Board. She was Chair of the Board in 2008 and 2009. She served as Vice-Chair of the Board from 2004 to 2008. Trustee Hunda has been a member of all Board committees and has chaired most of them. Prior to being elected to the Board, Judy Hunda worked with the Province on the creation of school councils in Ontario, established one of the city’s first school councils before they were mandated, then chaired two school councils and sat on a third simultaneously. She was also actively involved in the Board’s Parent Involvement Committee. She is a past member of the Board of Directors of the Ontario Public School Boards’ Association (OPSBA). She has also been invited to be a member of a number of Ministry panels and round table discussions. A lifelong resident of Sudbury, she is a graduate of MacLeod Public School and Lockerby Composite School. Trustee Hunda says her spirit continues to be uplifted when she witnesses the world through the eyes of children. Margaret Stringer retired in 2014 after a 34-year career in education with Rainbow District School Board, the Manitoulin Board of Education, Spirit River School Division and Saudi Arabian International School-Riyadh. She worked as a teacher and principal on Manitoulin Island as well as the system Principal of Special Education Programs and Services for the Board. Throughout her career, students with special needs were always close to her heart. As a system Principal, she collaborated with a variety of children’s services in Sudbury, Espanola and Manitoulin and gained additional training and experience in violent threat risk assessment, suicide intervention, and health and safety. Over the years, she worked with trustees on Employee Relations and Special Education Advisory Committees. She also contributed to Board Negotiating Committees. 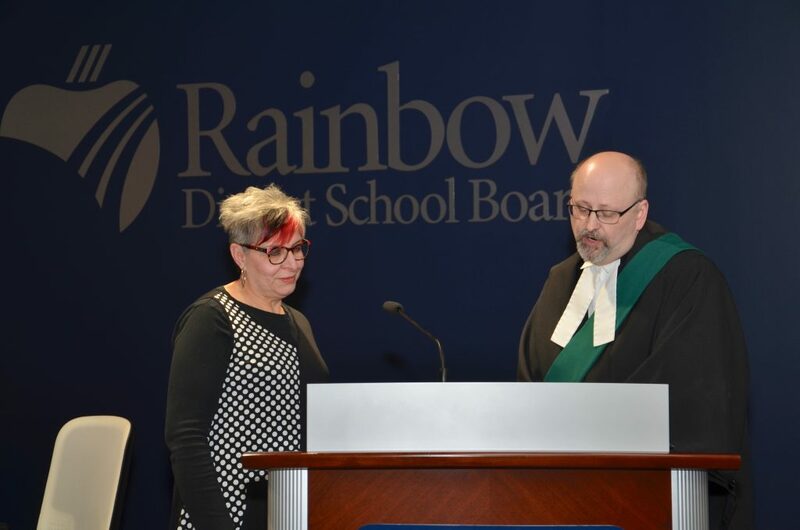 Through her work in ‘Learning for All’ and ‘Assessing Achievement in Alternative Areas’, Rainbow District School Board was a lead board provincially, embracing the philosophy that “what’s necessary for some is good for all.” In recognition of her dedicated service to students, Margaret Stringer received an Award for Excellence from Rainbow District School Board. She looks forward to bringing her passion for education to her role as trustee. Bob Clement was born and raised in McKerrow in the Espanola area and attended Espanola High School. He worked at Domtar, the town mill, as a lab analyst for 38 years and retired as a lab technologist. He obtained his diploma in analytical chemistry at the age of 50. Bob Clement was a trustee on the North Shore District School Board for nine years and the Espanola Board of Education for three years. 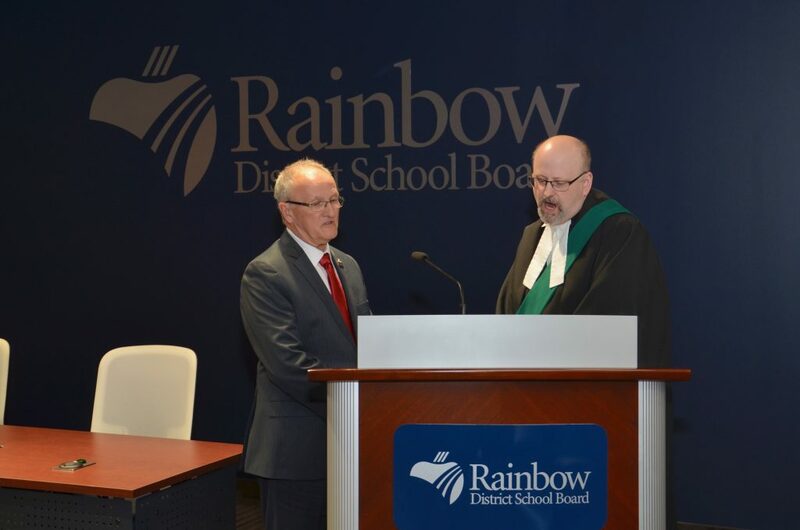 This is his third term as a trustee with Rainbow District School Board. As a trustee, he served on many committees, including Policy and Finance/Strategic Planning Committee, Negotiating/Labour Relations, and the Special Education Advisory Committee. He was Chair of the Literacy Committee. Bob Clement has been a volunteer fire fighter for 38 years and was promoted to Fire Chief in 1992. He has been married to Bonnie for 41 years. After watching their three children grow through the school system in Espanola and on to university, he is well aware that having the doors to education open to all is the secret to success. It is his goal to help keep that door wide open so that all children can attain their dreams. The 11 First Nations communities who have educational service agreements with the Board will announce the Trustee who will represent them at a later date.